Behind the name, design, and features of every single Louis Vuitton product, there is a special part of the history and tradition. Obviously, most of the history and tradition come from France, a native country of LV founder. An interesting thing is that France has a rich history and some of the most appealing specifics you can get. 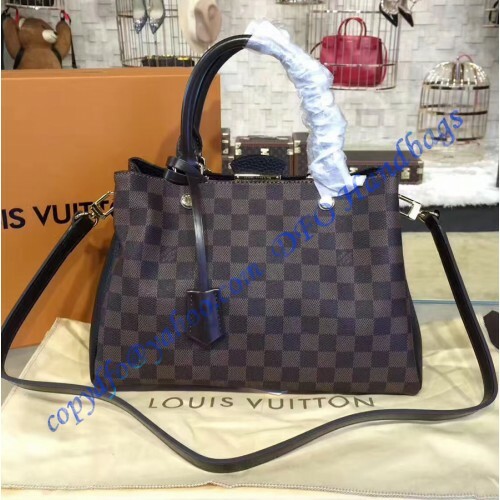 The specific bag, we have here is Louis Vuitton Damier Ebene Brittany. You who are proficient with history will probably know that Brittany is a small part of the territory in northern France. Before it became a part of the country, it was a small kingdom, also known as Little Britany. Some say that this place is like no other on the planet. We always like this addition, when a history is behind a bag or a wallet. It is possible to tell a story to your friends which increase the importance of a bag itself. Now we have to discuss the manufacturing process. 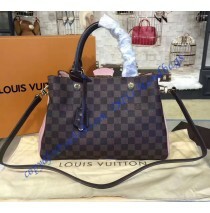 In general, this bag is made to be feminine and elegant, but also durable. LV mixed and match Damier Canvas with superior Cuir Taurillon leather. The bottom line is a bag which can literally withstand anything you can throw at it and it looks extraordinary no less. The leather is used for the sides, while the mentioned canvas is implemented at the front. Still, the bag has a curvy and adaptive design, meaning you can put more belongings inside and the bag will remain the same, slick and elegant. At the upper part, you have a snap-lock, which is probably the simplest and the most interesting alternative. Of course, nothing made by LV is ordinary and simple, so you still get a famous LV monogram on a gold-color plate. 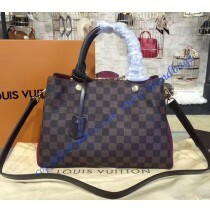 Additional features include padlock and key bell, carefully implemented into the bag’s design. They are there when you need them, but they won’t compromise the looks. In the matter of space, this bag has plenty to offer. You get 2 large compartments and 2 pockets for your smartphones. Both, larger compartments are snap lock-secured, while the central compartment is secured by a zipper. With the rich history and modern design, this bag is truly one of a kind. It is elegant, practical and looks like it just came from Little Britain. With the removable strap, you can carry it anywhere and anyhow you want.